These dragons have been stealing the harmless sheep from the farmer’s garden and pestering the peasant farmers for all that it’s worth. Defeat the dragons and you will be rewarded with many chests of gold and silver including a bonus free spin for your troubles. Don’t miss out on this mythical 5 reel casino slots site game. NextGen gaming is a game developer with over 20 years experience creating popular online slot games for all around the world. NextGen’s focus is to create games that deliver extraordinary entertainment and quality for their clients. The company attracts players though their unique games, entertain their players through the games they provide and retain their players from the stimulating and fun each game provides so they come back time and time again. This gaming developer lives up to its a name and is powering the future gaming industry. There are many more great NextGen games here, click play slot games. Take a step back in history with Dragon Drop as you enter a medieval setting where your surroundings are dragons, castle and farms. This colourful online slot game will soon be thinking you’re a hero as you will take on the role as a knight who must defend his castle from the dangerous dragon. The dragon also carries treasure chest or gold or silver so by defeating the dragon you will win the treasure. All the features in the game are activated by the dragon. This is a 5-reel game with 3 rows and 25 pay lines, dragons will appear above the 2, 3 and 4 reels and will randomly drop down to create wilds substituting all symbols except for a scatter. All winning paylines including the dragon will be multiplied by 2. A treasure chest, red turreted castle, a man with a pitchfork and scared looking sheep are the four highest value symbols. The lowest value symbols are 9, 10, J, K, Q and A. By saving sheep and farmers you’ll be rewarded a hefty amount of 250 times worth your stake. You can trigger the Sticky Dragon by finding 3 or more scattered eggs on the reels and be rewarded with 8 free spins. Any wins that are made during the free spins will be doubled. We also often run various promotions with this game. Play and join today! 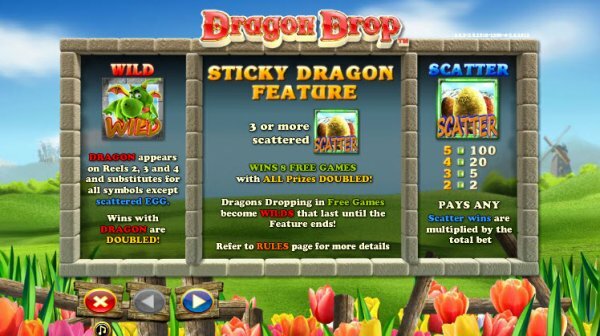 Dropping dragons may also appear during the feature if so it will remain in place as wild for the remaining free spins. Coins will increase significantly if you get multiple dragons on the reels continuously and could win an extraordinary amount of 1844 times your stake. The only drawback to this feature is free spins can’t be re-triggered. You can get more credits simply by guessing the colour of the card or suit, your wins will either be doubled quadrupled. However, if you guess wrong then the payment from the last spin will be voided. Don't missed to spin the wheel today. The game has a fantastic setting putting players in a real-life medieval situation with the thrill of fighting dragons and the soundtrack suits the theme perfectly. 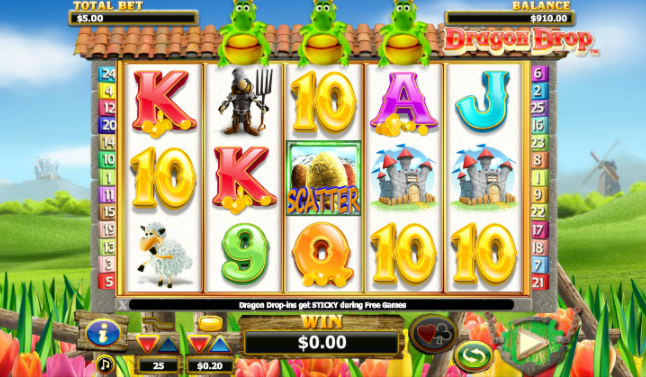 The game offers a great range of free spins especially the Sticky Dragon which can make the game more fun. The characters of game are comical with a dopey looking guard and chubby dragon making the game that little more entertaining. Dragons’ drop is simple little game that doesn’t take much time perfect if you’re just wanting a quick game. RTP 95.23%. Now, Get a free spins if you pay by mobile.